Mr. and Ms. S who had got married with our service last December visited us at LST salon. 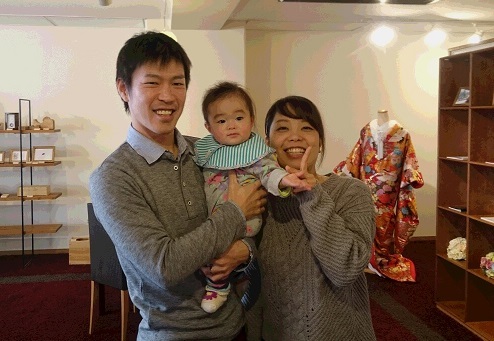 Chihiro-chan, who was in her mom’s tummy at the wedding is now eight months old already. Her cute round face made us happy. and their grandfather told them that their wedding ceremony was the best ever. And it was a delightful surprise that they remembered so much details about the day; from the movie played during the reception, a hair stylist to the MC. Thanks so much for coming, Mr. and Mrs. S and Chihiro-chan. We are looking forward to see you again on your next visit to Kyoto!